While exercising at the gym, the muscular symmetry is obtained with a dental bite called “Rectifier” which balances your entire body, head to toes, using the bio-mechanism of the mandibular lever. Due to this bio-mechanism that the bite is putting into effect, during your workout sessions at the gym it is, finally, no longer necessary to perform horrible and damaging muscular and postural compensations, that used to be required in order to perform all the repetitions. How would you feel being stable and symmetrical while repeating the side raises or when you’re doing the pull-downs at the lat machine or when you’re under the bench press? Would you like to complete your exercises without having to use the muscle and postural compensation mechanisms during the workout sessions, at the gym? Would you like to easily feel your strength increasing, due to the natural muscular symmetry of your body? How many times it occurred to you that while you were performing a certain exercise you had to, simultaneously, pay close attention to the left shoulder that was rising more than the right or one leg that reached its limit way before the other one did? Maybe you have often injured yourself in one of your weaker areas, such as the cervical area, or lumbar or perhaps the knee, or your shoulder? Even how many times have you seen guys who were achieving noticeable results way much faster than you did? How does it happen that your ‘six-pack’ friend is able to put on muscular mass so easily, and do all the exercises without ever getting tired? Do you really believe it is a matter of genetics or food supplements? The answer is neither in the diet, nor in the supplements and it is not in the genetics, either. Maybe you train even harder than him, you eat more than he does, and you work out harder than him but in the end, you can not even complete the series of side lifts with 8kg per side. Have you ever wondered why? On the other hand, aren’t you tired of feeling the same weakness, always in the same spots, ant not being able to explain how is this possible? Well, if you’re reading this article, it’s probably because you want to take a serious turn in your training and finally answer all these tormenting questions. You should know that while you put the same amount of effort into training and the quantity of ingested food does not change, what really makes the difference is not GENETICS, but BIO-MECHANICS. Your friends who have more muscles have only had the good fortune to be born with a better skull-mandibular relationship than yours, thus allowing them to be able to train more easily, simply because their body was more balanced than yours. They were lucky enough to have a better mandibular-skull relationship in their genetic inheritance, that’s all. But now you can have it too! Actually, your postural mechanism could be even more symmetrical and balanced than theirs, thanks to the Rectifier. It’s all about acting upon the mandibular lever which provides symmetry for the mandibular-skull relationship, by making the first muscles connected to it symmetric—specifically, by making the jaw, the masseters and the temporal muscles symmetrical. From here, this muscular symmetry will pass through swallowing and through the act of biting the rectifier, from your mouth to all the muscles, making your body stable and symmetrical during your exercises. You will no longer be forced to lift the left shoulder while performing your exercise, for compensation. This way, you could finally work out the exercises, symmetrically. Finally you will stop feeling inadequate or guilty and you will be able to train better than others, because your performance at the gym no longer depends only on how hard you train, how much effort you put in, how much you eat, your “genetics”, your metabolism, the supplements that you do not take, or the strangest sessions of workouts that you may come up with and yet, that you do not do. It is not a question of genetics, it is a question of bio-mechanics! In order to activate the mandibular lever that supports the skull towards a symmetrical, ideal position in space, the Rectifier is required! Thanks to this device, your skull will support itself in the ideal position while, consequently, it will also stretch the spine. Moreover, it will also make all the muscles of your body work in a symmetrical manner, starting from the chewing muscles, that is, the masseters, and the temporal muscles, and all the eligible muscles. The Rectifier is not the usual bloody bite that the “experts” of the sector are offering you. It is not a useless piece of soft rubber placed between the dental arches that only gives the vain hope of an improvement in sports performance without even letting you know how it works. Perhaps, the claim is you may thank the Holy Spirit? Instead, the Rectifier is a Splint that is positioned on the lower arch and is assembled with different materials in such a way that the Starecta method can be applied correctly. This splint works according to a specific method, for which you will have to record your straight posture in the bite! But let’s try to understand how it is done and why it actually works. The Rectifier is a dental splint built with certain characteristics and must be applied in a unique way, considering all the other dental splints. These 3 characteristics are able to activate the mandibular lever effect, that is able to push the skull upwards in an ideal position and consequently to stretch the spine. Moreover, it is lengthening and giving stability to the short and weak side of the body, exactly the side where you are constantly forced to muscularly compensate. For configuring the Rectifier it is important to record an advanced position of the jaw, as shown in the video tutorial, by taking it head to head or even a few millimeters further. This position is called protrusive mandibular and together with the ditches imprinted in the bite and the height of the molar area helps bringing the skull backwards. It it shown how the teeth ditches of the upper jaw are imprinted in the hard, thermoplastic material according to specific instructions. These ditches are required in order to recreate a stable occlusal signal, in order to transfer the imprinted correct posture to your entire body. The method used by the patient for registering their dental footprint on the Rectifier follows a procedure which is called the Starecta Method. This method serves for the correct registration of the correct posture on the Rectifier, and it is required in order to activate the Mandibular lever; you can find it in detail on the home page of the starecta.com website. Before you read this article you were destined to constant and frustrating failures, and to be able to change your stand off situation, it would have taken a miracle for you. But now, everything is different, because you can actually use this tool yourself, and benefit from its ability to help you train in symmetry! In order to understand how important symmetry is while you’re training at the gym, you should try to observe the body of the greatest bodybuilders of the world, especially the ones with the most extended longevity, and in particular those who have had important results over the years of their existence! You will notice that beyond their volumes and proportions, a fundamental characteristic that they have in common is the symmetry, both in their faces and in their bodies. 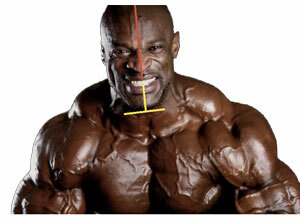 One of these famous bodybuilders is Ronnie Coleman, 8 times winner of the mr Olympia international contest. Look carefully at both Coleman’s face and abdomen, you will notice that they are perfectly symmetrical. What does the mandibular-skull assembly’s symmetry have to do with the symmetry of the body? You should simply think of our mandibular skull relationship as the rudder of a ship, it controls its direction. A centered rudder will undoubtedly maintain a straight course, while a shifted rudder will deviate the ship from its straight course. A shifted rudder that will deviate the ship from its straight course will constantly engage the entire crew into a struggle to find a way to correct such a deviated course. The exact same thing happens to your asymmetrical body, while it tries to constantly compensate for your efforts when you are exercising at the gym. Both in nature, and in the construction of artificial vehicles symmetry is fundamental in order to have better performance and fewer injuries, or breakdowns. So stop suffering in vain when you’re at the gym and start TRAINING IN SYMMETRY with the Rectifier! Immediately after you have started wearing the Rectifier, you feel more stable, balanced, centered! You will now be able to apply force correctly, without having to compensate each time, by bringing the left shoulder higher or closer to the head. Besides, you will be able to finally unlock from that no go situation that you’re in, and start loading more! Consequently, you’ll grow more muscles, along with a considerable decrease of the probability of being injured.